Flannel Friday: Feed Cookie Monster!! At $3, I thought they were a great find for our toddler playtime toys. Then one of my co-workers told me that (at the time) these types of foam puzzle mats (EVA foam mats) were being pulled from shelves for containing unsafe levels of formamide. Now some might call Ms Debbie a “safety nut”. I don’t know about you, but I think “safety nuts” are pretty awesome to have as coworkers when you work in a busy children’s department. I didn’t have the heart to throw them away, and they’ve been sitting on a shelf for a more than a year. Flash forward to earlier in the week when I was opening a case of coffee from costco, and I noticed the box makes a perfect “feed the _____” storytime prop. If you look at the image below, you’ll notice there’s a big window/opening on the side of the box so you can reach in and grab a pod. The box comes perforated in an almost-perfect mouth shape. 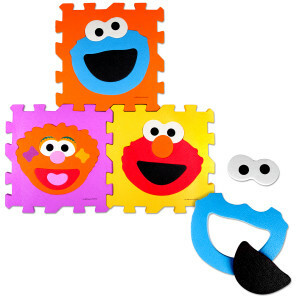 I immediately thought of the cookie monster puzzle mat. When I held it up to the box it was a nearly perfect fit. I just had to cut little bit on the bottom to fit his giant smile. So I glued the puzzle pieces together (leaving the mouth to pop in and out, of course). I also wanted to cover the box somehow. So I grabbed a roll of blue duct tape and went to town. 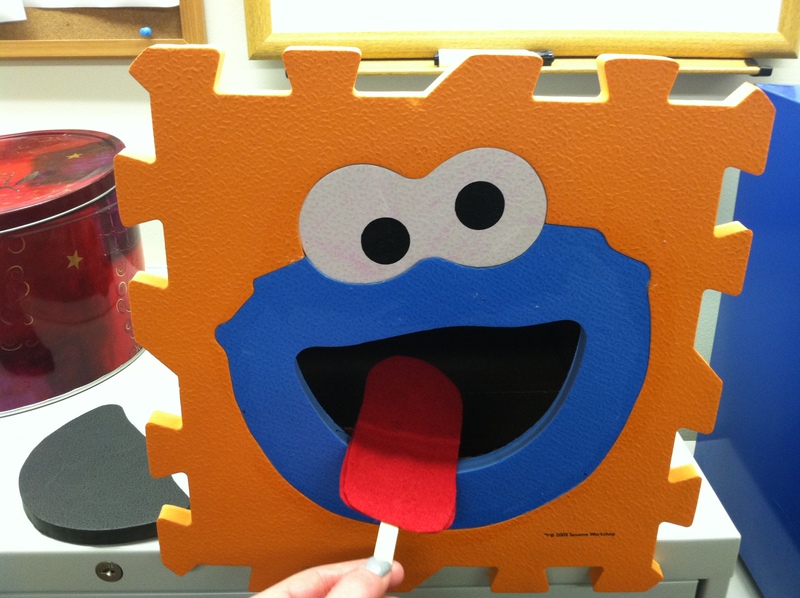 I couldn’t find any flannel cookies earlier, so here’s a picture of Cookie Monster eating a popsicle. But maybe CM will get tired of eating cookies and decide to eat some letters, numbers, colors, shapes, fruit, etc. Oooo! The letter C! 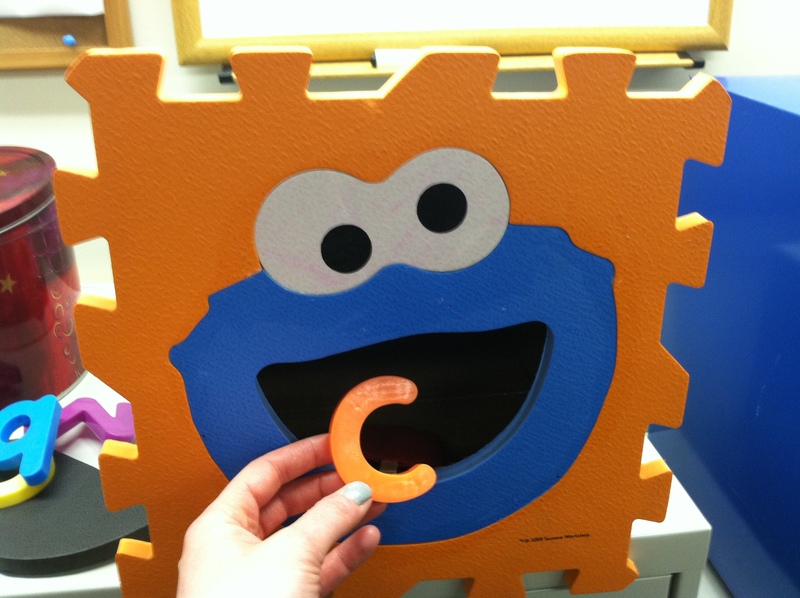 C is for cookie, that’s good enough for me! Cookie cookie cookie starts with C! And if you search pinterest for “feed the monster” you get about a zillion results. Now, that may seem a little ho-hum, but what’s amazing about the “feed Cookie Monster” concept is that there are a million ways to expand/alter/reuse the concept to keep it interesting. Oh! and I almost forgot. 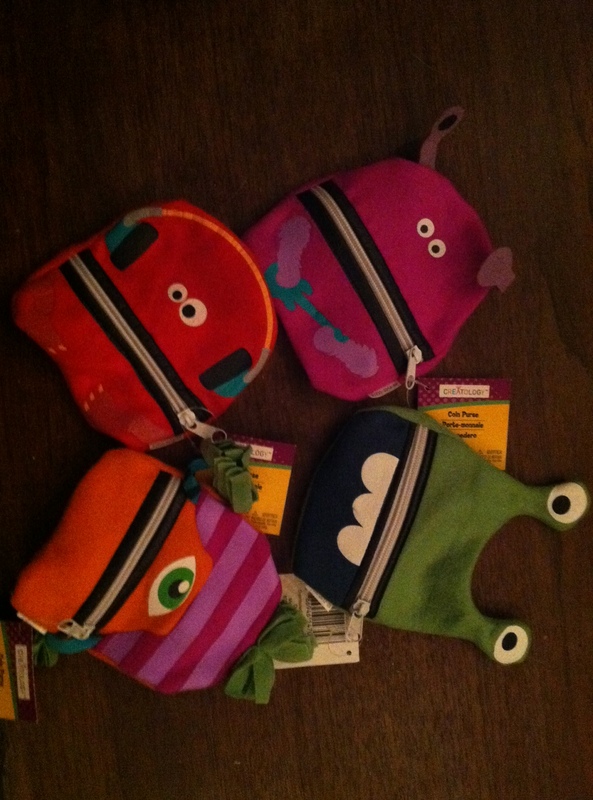 I stopped by Michaels for some glue, and as I was running through the impulse-buying section, I spotted these amazing little monster zipper pouches. These are perfect for some sort of storytime activity involving monsters eating stuff. I don’t have a specific idea for how to use them yet, but for a $1 each I had to snap them up. I bought 4 of them, and can’t wait to think put them to work! Happy FF! Sharon is hosting a very special #FFRU this week in many FFers are waxing philosophical this 2yo blogging tradition: What Does Flannel Friday Mean To Me? Fun idea Cate! … and so versatile. What a great idea. Its so hard to walk by cute, affordable stuff that you just maybe could use sometime, isn’t it? 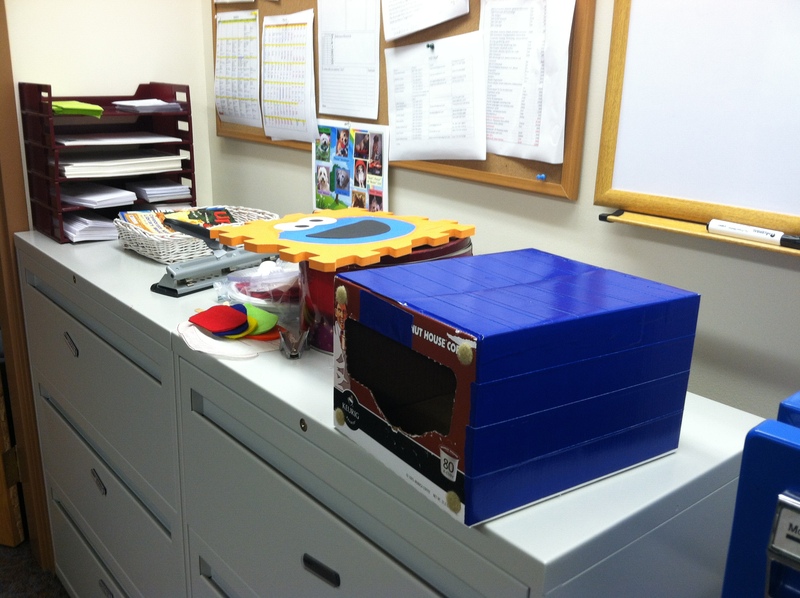 The box is fabulous and having materials on hand even the best. It is such a good feeling when it comes together. I have a cookie monster puppet, and his mouth opens…of course he spits out everything he doesn’t like. And what does he like? Only cookies!! We’ve fed him everything…letters, colors, all sorts of fake fruit and veggies and plastic burgers….but nope, only cookies make him happy. I honestly believe that the kiddos would be happy to feed the cookie monster for the entire time of story time!! Have fun! i know! i love duct tape! I imagine i’ll have the same experience when i use it in storytime. According to Storytelling with Puppets by Connie Champlin, those kinds of puppets are called “Swallowing Puppets.” Love this idea. How about buying small zippers with adhesive backs and gluing them to cardstock/construction paper so each child has their own monster to feed at home? You can use volunteers to help prep the craft! that is an excellent name. I was trying to think of some mashup of the words glutton+puppets, but it was getting complicated. and i like the take-and-make idea!